In 1947 the British put the future of western Palestine into the hands of the United Nations, the successor organization to the League of Nations which had established the Mandate for Palestine. A UN Commission recommended partitioning what was left of the original Mandate – western Palestine – into two new states, one Jewish and one Arab [Not a Palestinian state]. Jerusalem and its surrounding villages were to be temporarily classified as an international zone belonging to neither polity. What resulted was Resolution 181 [known as the 1947 Partition Plan], a non-binding recommendation to partition Palestine, whose implementation hinged on acceptance by both parties – Arabs and Jews. The resolution was adopted on November 29, 1947 in the General Assembly by a vote of 33-12, with 10 abstentions. Among the supporters were the United States and the Soviet Union, as well as other nations including France and Australia. The Arab nations, including Egypt, Syria, Iraq, and Saudi Arabia denounced the plan on the General Assembly floor and voted as a bloc against Resolution 181 promising to defy its implementation by force. The resolution recognized the need for immediate Jewish statehood (and a parallel Arab state), but the ‘blueprint’ for peace became a moot issue when the Arabs refused to accept it. Subsequently, de facto [In Latin: realities] on the ground in the wake of Arab aggression (and Israel’s survival) became the basis for UN efforts to bring peace. Resolution 181 then lost its validity and relevance. Having received and examined the report of the Special Committee (document A/364). … Recommends to the United Kingdom, as the mandatory Power for Palestine, and to all other Members of the United Nations the adoption and implementation, with regard to the future Government of Palestine, of the Plan of Partition with Economic Union set out below; …” [italics by author]. Resolution 181 was the last of a series of recommendations that had been drawn up over the years by the Mandator and by international commissions, plans designed to reach an historic compromise between Arabs and Jews in western Palestine. 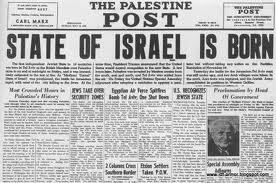 The first was in 1922 when Great Britain unilaterally partitioned Palestine. This did not satisfy the Arabs who wanted the entire country to be Arab. Resolution 181 followed such proposals as the Peel Commission (1937); the Woodhead Commission (1938); two 1946 proposals that championed a bi-national state; one proposed by the Anglo-American Committee of Inquiry in April 1946 based on a single state with equal powers for Jews and Arabs; the Morrison-Grady Plan raised in July 1946 which recommended a federal state with two provinces – one Jewish, one Arab. Every scheme since 1922 was rejected by the Arab side, including decidedly pro-Arab ones because these plans recognized Jews as a nation and gave Jewish citizens of Mandate Palestine political representation. in describing the reason for Arab rejectionism of Resolution 181. This description hardly fits reality. Seventy-seven percent of the landmass of the original Mandate for the Jews was excised in 1922 to create a fourth Arab state – Trans-Jordan (today Jordan). “17,000,000 Arabs now occupied an area of 1,290,000 square miles, including all the principal Arab and Moslem centres, while Palestine, after the loss of Transjordan, was only 10,000 square miles; yet the majority plan proposed to reduce it by one half. UNSCOP proposed to eliminate Western Galilee from the Jewish State; that was an injustice and a grievous handicap to the development of the Jewish State.” [italics by author]. On May 17, 1948 – after the invasion began, the Palestine Commission designed to implement 181 adjourned sine die [Latin: without determining a date] after the General Assembly appointed a United Nations Mediator in Palestine, which relieves the United Nations Palestine Commission from the further exercise of its responsibilities. – the most constructive path to solving the conflict. By the time armistice agreements were reached in 1949 between Israel and its immediate Arab neighbors (Egypt, Lebanon, Syria and Trans-Jordan) with the assistance of UN Mediator Dr. Ralph Bunche, Resolution 181 had become irrelevant, and the armistice agreements addressed new realities created by the war. Over subsequent years, the UN simply abandoned the recommendations of Resolution 181, as its ideas were drained of all relevance by events. Moreover, the Arabs continued to reject 181 after the war when they themselves controlled the West Bank (1948-1967) which Jordan invaded in the course of the war and annexed illegally. 181 as leverage to bring about a greater Israeli withdrawal from parts of western Palestine and to gain a broader base from which to continue to attack an Israel with even less defendable borders. Both Palestinians and their Arab brethren in neighboring countries rendered the plan null and void by their own subsequent aggressive actions. “To attempt to show … that Resolution 181(II) ‘remains’ in force in 1981 is thus an undertaking even more miraculous than would be the revival of the dead. It is an attempt to give life to an entity that the Arab states had themselves aborted before it came to maturity and birth. To propose that Resolution 181(II) can be treated as if it has binding force in 1981, [E.H., the year the book was written] for the benefit of the same Arab states, who by their aggression destroyed it ab initio, [In Latin: From the beginning] also violates ‘general principles of law,’ such as those requiring claimants to equity to come ‘with clean hands,’ and forbidding a party who has unlawfully repudiated a transaction from holding the other party to terms that suit the later expediencies of the repudiating party. [italics by author]. Resolution 181 has no legal ramifications – that is, Resolution 181 recognized the Jewish right to statehood, but its validity as a potentially legal and binding document was never consummated. Like the proposals that preceded it, Resolution 181’s validity hinged on acceptance by both parties of the General Assembly’s recommendation.